Hi friend! I hope you’ve been having a spectacular week. This post is coming to you a little later than usual because I wanted to make sure it was on your radar for the weekend because who doesn’t want to wake up to a house smelling like banana bread? However, this isn’t your mama’s banana bread! 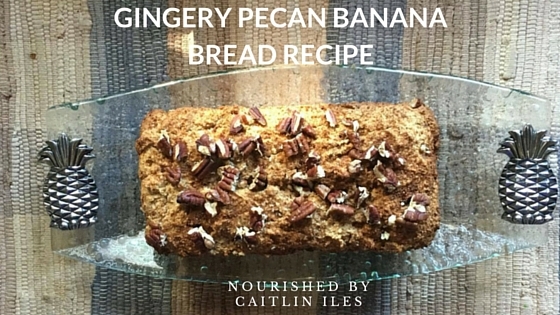 I’ve souped it up with tons of delicious and healthy ingredients like pecans for protein, ginger for digestion, and olive oil for glowing skin so you can have your cake and eat it to! Pecans are a great source of plant-based protein, which will help ensure that this treat keeps our blood sugar stable. They are also chock full of healthy fats, tocopherols, and other potent antioxidants that have been shown to lower LDL cholesterol and help manage inflammation in the body. Olive Oil is another powerhouse that is high in oleic acid, a monounsaturated fatty acid that is associated with cardio-protective health benefits. New research shows that it’s effect on post-meal blood sugar and LDL cholesterol levels may be at the root of it’s role in preventing heart disease. This oil is also incredibly high in antioxidants, which is always beneficial for helping keep our cells happy, healthy, and vibrant! Ginger is probably one of my favourite culinary spices and the more research that comes out the more I fall in love with this humble and affordable medicine! Not only does it help stimulate digestive function in the body, but it can also help with chronic pain without the side effects of non-steroidal anti-inflammatory drugs, help manage blood sugar imbalances in type 2 diabetics, and has even been recommended to help manage PMS symptoms! That’s a pretty magical spice to me so I try to get at least a little bit every day. Adding it to baked treats is a great way to indulge healthfully. I’ve also made this loaf completely grain-free so it’s great for those suffering from leaky gut or other digestive issues. It’s got lots of protein, healthy fats, and fibre so it can also make a great breakfast or snack. Enjoy! Grease a small bread pan with olive oil . Place dry ingredients into a small food processor and grind until pecans are relatively smooth. Pour into a medium sized mixing bowl. Add wet ingredients into the food processor and blend until smooth and frothy. Pour into dry ingredients and stir until combined. Spread into greased bread pan and top with palm sugar and pecans. Bake for 45 minutes, rotating after 25 minutes. Check that a toothpick/knife inserted comes out mostly clean. Remove from oven and let cool in pan 3-5 minutes then remove and place on cooling rack. Well friend, that’s our protein packed, delicious treat for the week! If you want to learn how to take control of your food cravings and reset your body and metabolism make sure you check out my Free Stop Self-Sabotage Workbook. You can download it FREE here. Thanks for stopping by friend and have a beautiful day!